Discussion in 'The Lounge' started by syadasti, Dec 20, 2007. A clip/bolt-on mirror isn't enough??? We've seen some bike-centric GPS devices and sound systems in the past, but we've never seen a device that actually encourages you to ride around while staring down at a screen -- which is probably the fatal flaw with the Cerevellum bicycle rearview monitor. The prototype unit shown here features a 3.5-inch screen and a 4-hour battery life, along with 32MB of storage for workout data and four USB ports for expansion modules. 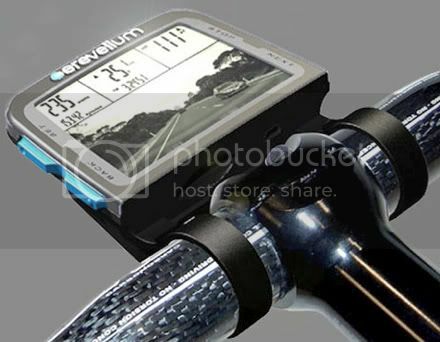 The Cerevellum is expected to cost some $200 when it goes into production, and the company says it's developing GPS and heart-rate monitor modules to ship soon after -- all far better uses of a handlebar mounted screen than a rearview camera that accomplishes nothing a quick look over the shoulder can't get you, we think. I'd totally crash into a lightpole staring at that thing. It would be nice to have a front-view option for road riding. Keep your head down, keep your eyes on the monitor. Nissan/Infiniti has 360 view (Around View Monitor) on their new 2008 EX. I bet you could mount the camera to point forward.